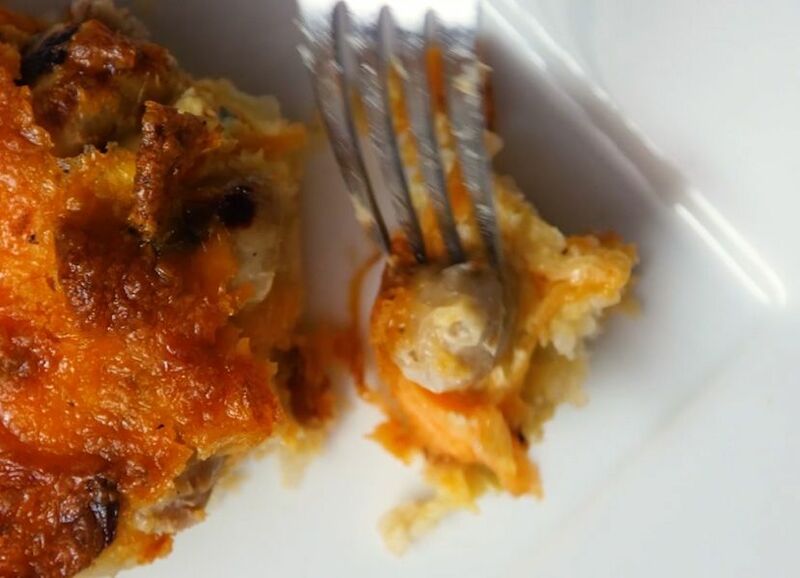 This meat lovers breakfast pie is sure to satisfy even the burliest of lumberjacks. If 2 cups of cheese doesn't do the trick for you, the bacon will. Need some energy for a big day of work or maybe just an epic dish to bring to Sunday brunch? 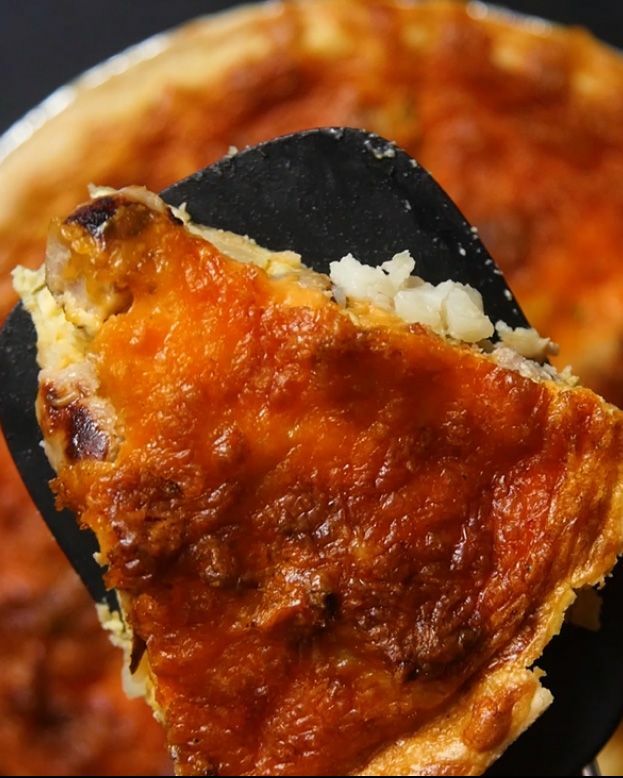 Then here's your recipe.Think of this as the cheesiest, meatiest quiche that you've ever had the pleasure of tasting. Pre-heat the oven to 375 degrees. Cook your breakfast sausage and bacon on the stove top or in the oven and set them aside. 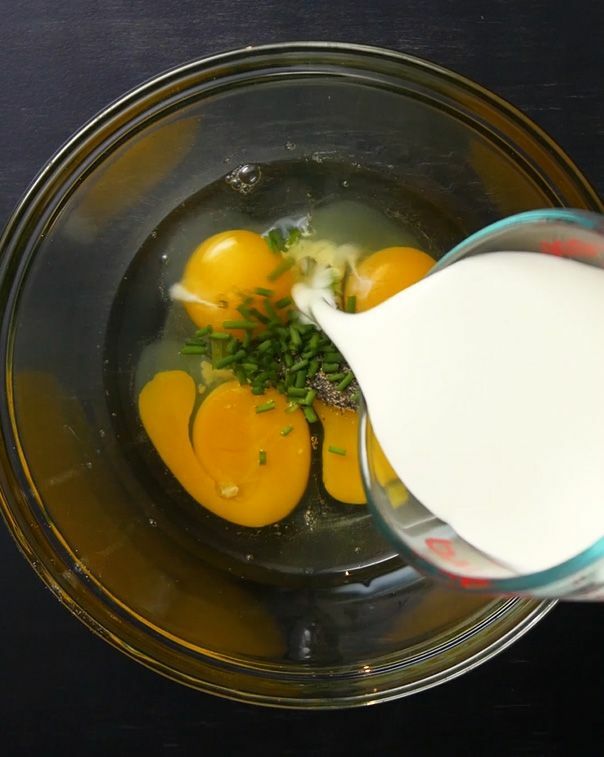 Whisk the first 6 ingredients together in a bowl and set them aside. 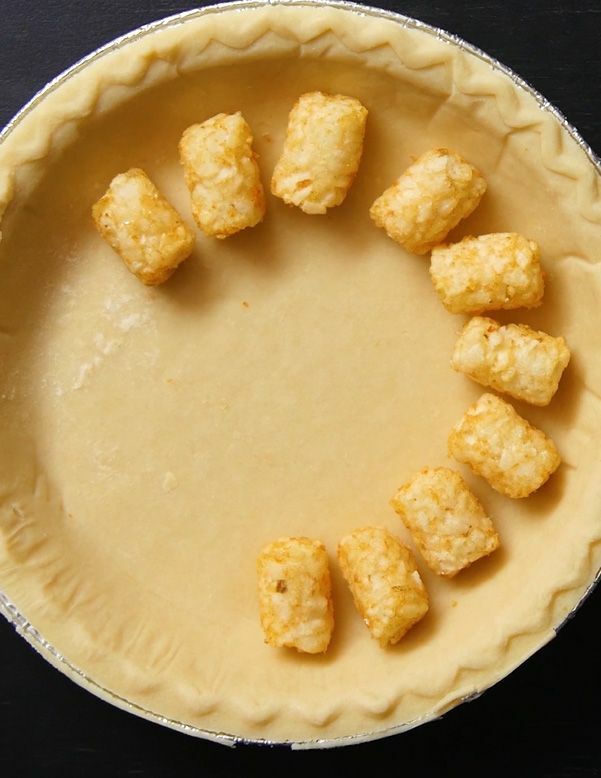 Next prepare the base of your breakfast pie by lining the entire crust with tater tots. 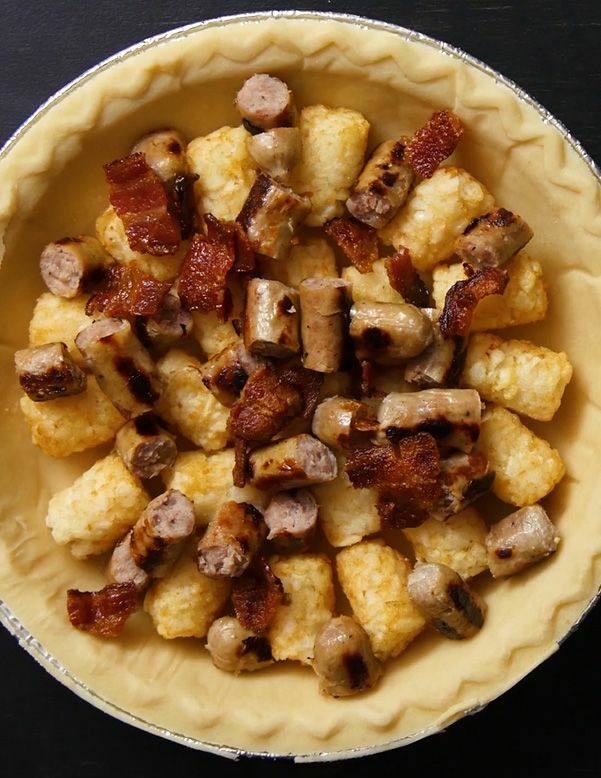 Add the cooked sausage to the pie and spread evenly. Now chop the bacon and sprinkle it on top. Pour your egg mixture on top of the crust. 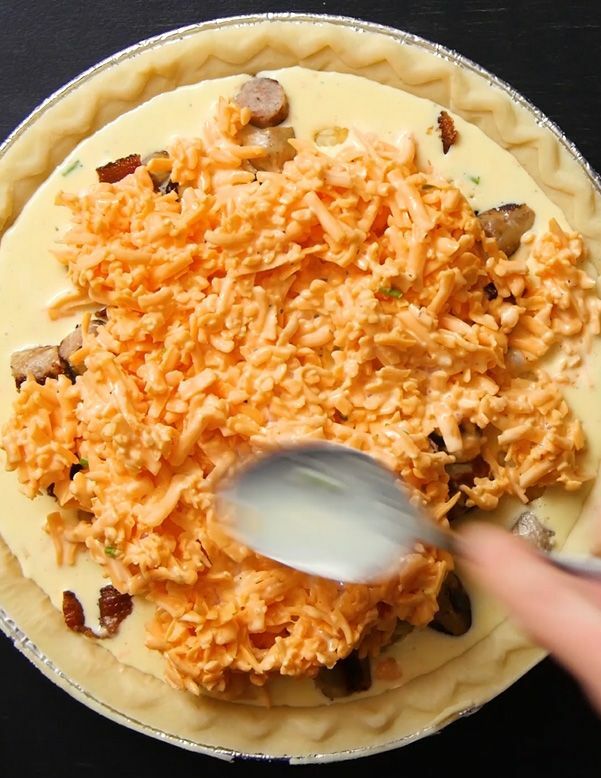 I can almost guarantee that the cheese will be sitting on top like a mountain of glory; so you're going to need to take a spoon, flatten it out and spread it around evenly. Line a cookie sheet with aluminium foil and put the pie on top. Bake 375 for 50 minutes. 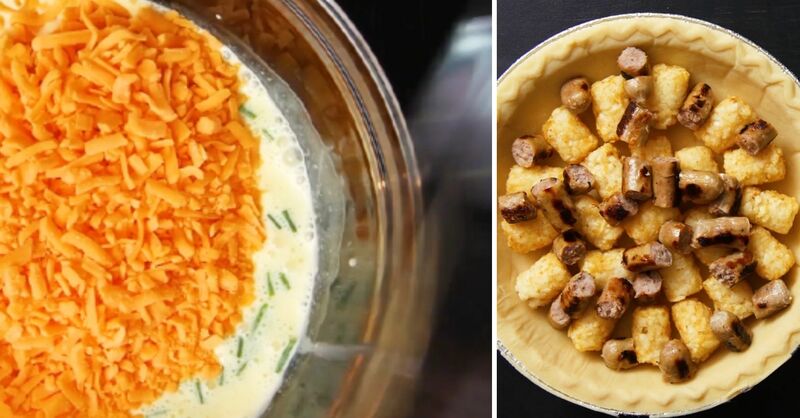 Your pie is so full of cheese that it's likely to boil over. The baking sheet will prevent a mess on the bottom of the oven. Let your meat pie rest for 15 to 20 minutes. 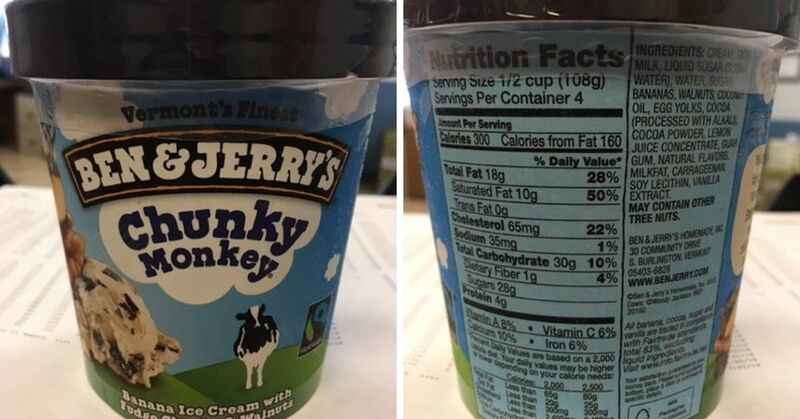 Let's be honest, we've seen prettier breakfasts but the flavor profile here is next level. 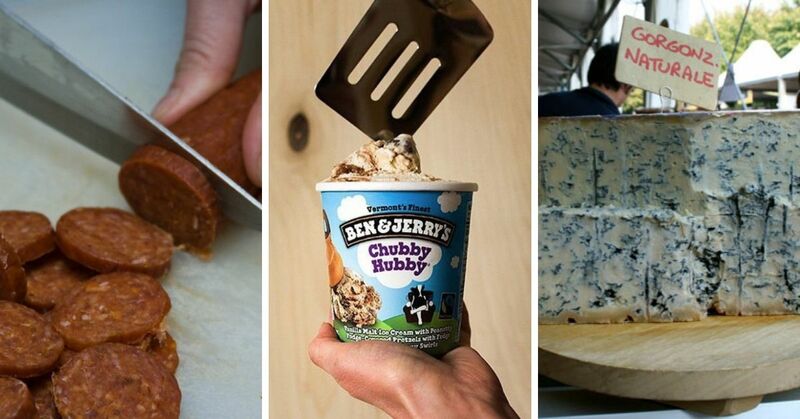 Cut into 8 pieces and enjoy! This one will keep you full for a while. Wontons for breakfast? Yes please! These little breakfast goodies are like tiny fried burritos. Eggs, cocktail sausages and cheese make for satisfying small bites. You can bake these little suckers on aluminum foil if you'd prefer. It just takes a little longer. 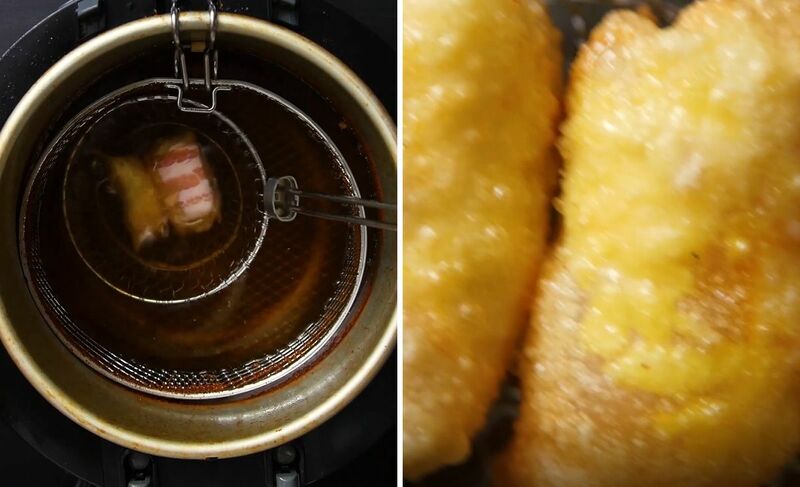 Plug in your deep fryer to heat up the oil. First prepare your ingredients to put inside of your wontons. On a stove top pre-cook your cocktail sausages and tater tots then set them aside. 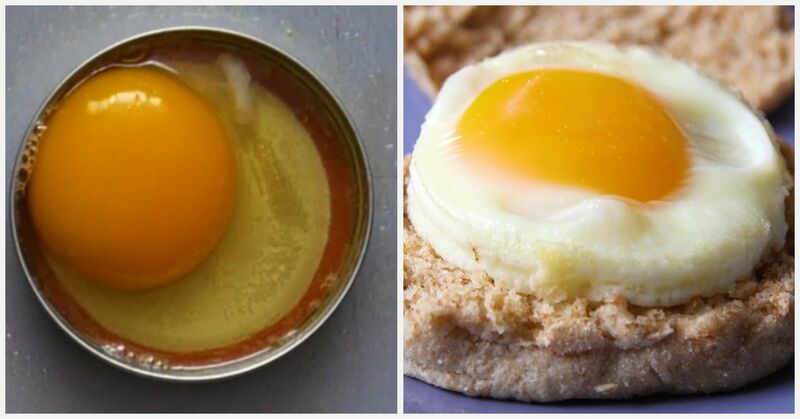 Scramble three eggs and place them into a dish with a small spoon. 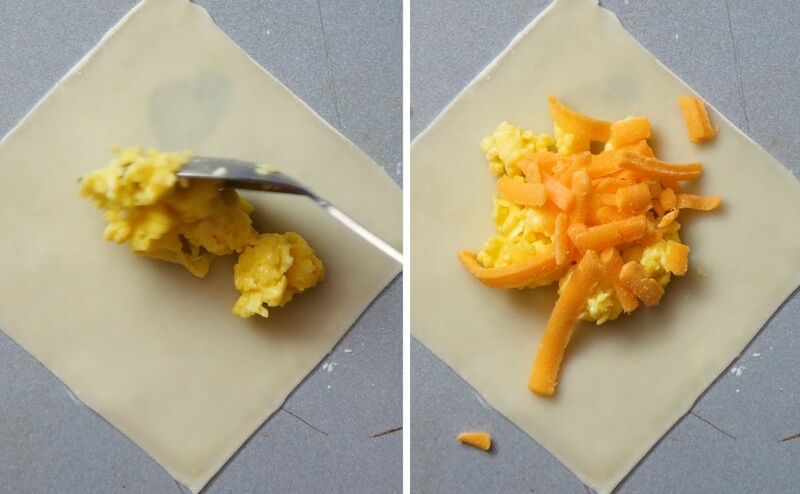 A great method for scrambling eggs is to use chopsticks for stirring.This will give you a consistent texture. Grate 1/2 a cup of cheddar. Take an uncooked wonton and place it in a diamond shape. Add a tsp of scrambled egg. Add a sprinkle of cheddar. Place cocktail sausage in the center. 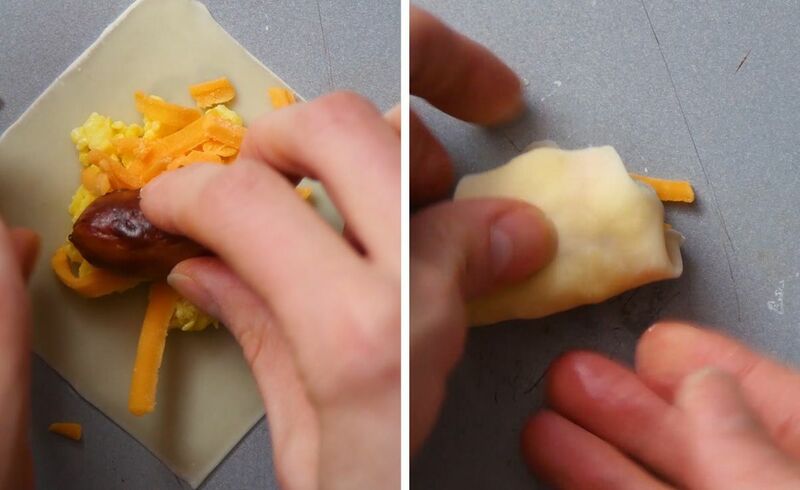 fold over the edges of the wonton and then roll it up. Seal the wrapper by placing a small dab of water at the top. Next use a tater tot in the center of the wonton. Continue this process until you have your desired amount of burritos for frying. 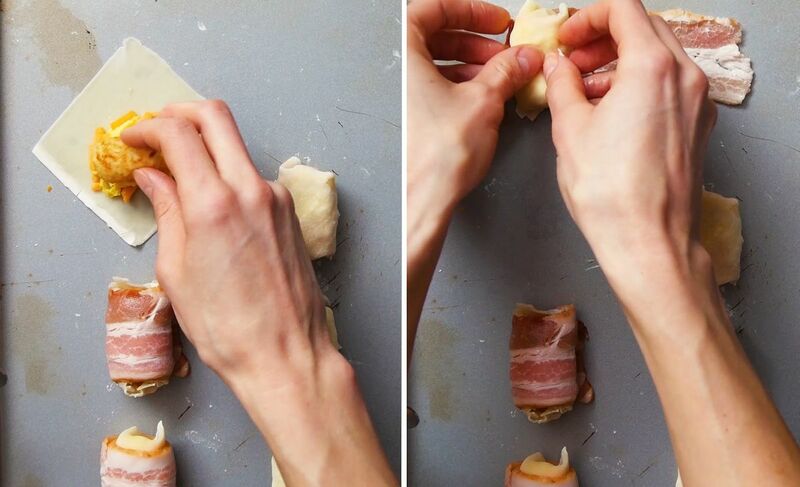 Cut your bacon in half and roll up the burritos that have a tater tot inside. 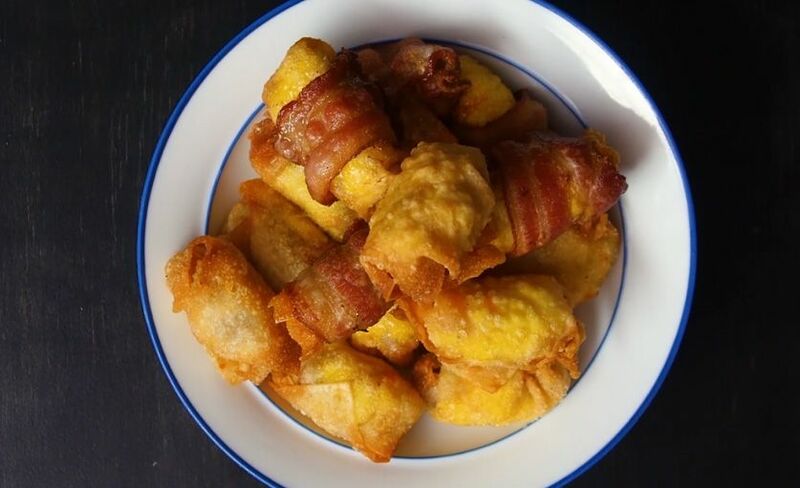 Fry your mini burritos in the deep fryer for about 3 minutes or until they are golden brown. You'll need to cook these ones a few seconds longer than the ones without bacon. 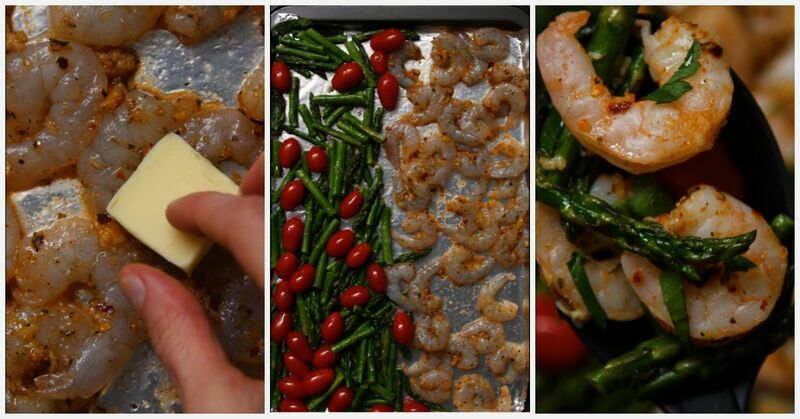 Remove the excess oil by placing them on a paper towel when you take them out of the fryer. 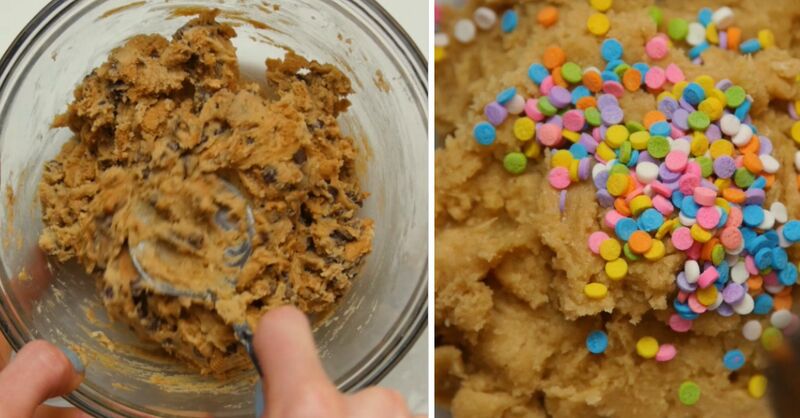 If you bake these little guys. 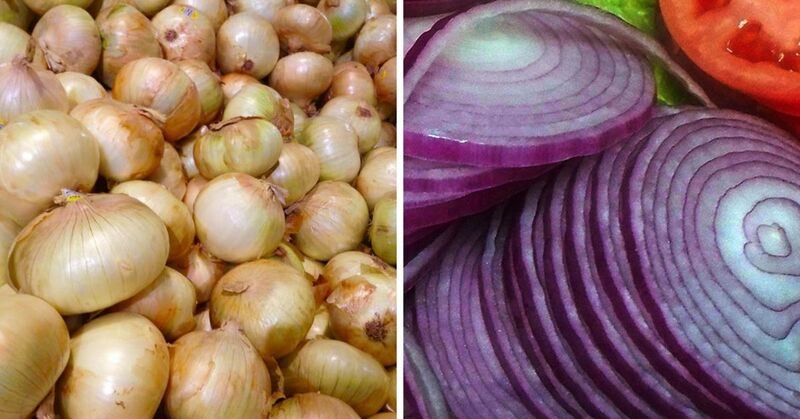 Brush them with avocado or canola oil before placing them on a baking sheet at 475. Cook for approximately half an hour turning at least once. Serve these on a mini tray and watch them disappear. These aren't only great for brunch; they're perfect for game day and parties too! Just don't over stuff them or they'll burst open in the fryer.